Liverpool, having won the League after beating United at Anfield just under four weeks ago, have done what all teams do who win the title early and gone sloppy. Having lost at home to Southampton on Saturday just passed, tonight they lost at Old Trafford with a team that included the return of Bram Stoker’s favourite Uruguayan and also skipper, Steven ‘sussudio’ Gerrard. Prior to tonight’s match, a sizable amount of coaches carrying Liverpool fans entered Old Trafford from Trafford Park Road. Almost every single one of them had Liverpool fans banging furiously on the windows shouting all kinds of incomprehensible but clearly very excitable rhetoric. Once off the coach and mingling towards the turnstiles for the upper tier of the Scoreboard End, they weren’t quite as forthcoming. About forty five minutes before kick off however, I could clearly hear the Munich song being sung loudly on the corner of Trafford Park Road and Warwick Road by what was to my eyes, a firm of about 30/40 young Liverpool fans whom were obviously ‘up for it’. How they managed to get so close to the ground and evade the attention of both the local police and some of United’s more ‘lively’ fans is a mystery to me. Inside the ground, just before Luis Suarez hit the bar on 74 minutes, a Liverpool fan threw a live distress flare into the K Stand. 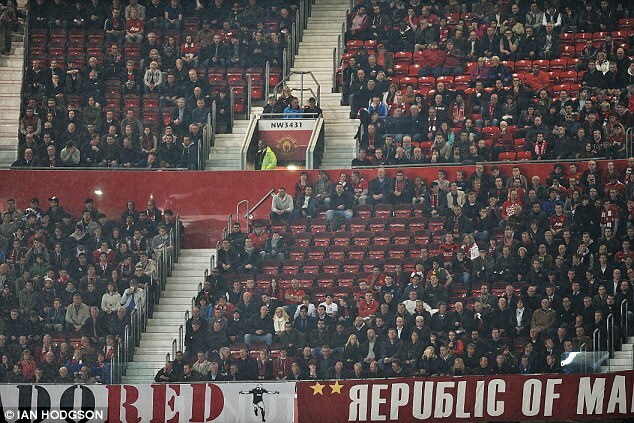 I know plenty of reds who were unhappy about being placed under the scousers for tonights match. After the rarely reported but notorious incident at the FA Cup game at Anfield in 2006 where a plastic cup loaded with excrement was thrown onto United fans by Liverpool fans in the upper tier of the Anfield Road, I don’t blame them. I know that United fans are not perfect, only a one eyed fool would think so but bearing in mind that United have had ticket allocations slashed at Anfield for comparatively spurious reasons, after what happened tonight, I think it’s time United did the same to Liverpool for the League game that’s due to be played in March. 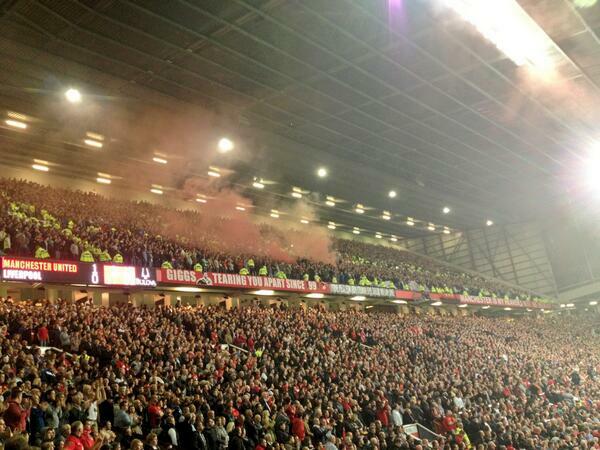 I’m aware that strictly speaking, distress flares shouldn’t be lit in football grounds. Personally, they don’t really bother me but it is bang out of order when they get thrown indiscriminately at opposition fans in the tier below, no matter who’s playing who. After a transfer window where David Moyes struggled to sign an autograph and United’s skills of negotiation made the notorious Garry Cook look the model of professionalism, we are now thankfully back to the real football of United after every small town inbred’s favourite side played Ukraine and Moldova. As we all know, United eventually signed Marouane Fellaini after Everton Chairman Bill Kenwright showed United’s new Chief Executive up for the amateur that he is. Apart from the Warwick Road swag grafters, I can’t think of anybody who’s first choice midfield signing would have been Fellaini, but what I have no doubt about is that he’s a vast improvement on Anderson and Tom Cleverley. For Anderson, it may be a cruel coincidence that he chose yesterday to have possibly his worst ever game for United (there’s some stiff competition for that). It took me ten minutes to realise he was on the pitch, when I first noticed him he gave the ball away in midfield and proceeded to do that for the rest of the first half. When Palace midfielder Kagisho Dikgacoi conceded a very dubious penalty on forty two minutes, Anderson was running to the referee Jon Moss, like a coppers nark mithering him to send off Dikgacoi. Strictly speaking, seeing as the referee believed it to be a foul and Young was the last man, the sending off of Dikgacoi was the correct decision but it sickens me to see any footballer trying to get another footballer booked or sent off. When I see a United player doing it, it disgusts me. As dubious as the penalty was, a half time lead for United was a fair score. Robin Van Persie despatched the penalty with aplomb having been thwarted by the crossbar nine minutes earlier. On the hour, Anderson applied the coup-de-grace to his afternoon by tripping over the ball. Next time the ball went out of play, Anderson instinctively looked over to the United bench expecting to be substituted, it was his wisest move of the day. Fellaini came on to a rapturous welcome and parts of Old Trafford resembled a shebeen on Claremont Road in 1978, such was the abundance of afro syrups springing up in homage to United’s new Belgian signing. Wayne Rooney sealed the game for United on 78 minutes with a well taken free kick from thirty yards. Any result other than a United win would have been a travesty even if Uniteds first goal was never a penalty. Crystal Palace were a game and plucky side but they only threatened United’s goal once, when Dwight Gayle wasted a great oportunity on 41 minutes after ghosting past a napping Rio Ferdinand.